First Shrooming of the Season! The San Francisco Bay Area hosts a rich diversity of ecosystems from marshlands and grasslands to chaparral and temperate evergreen rain forests. Mount Tamaplais alone touches many different kinds which makes it a beautiful place to search for mushrooms. In one day we found over 10 different kinds of shroomies including a small Lion’s Mane and a couple Angel Wings among others. 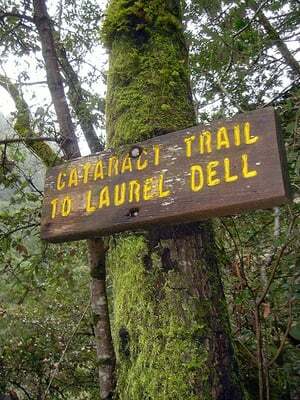 Cataract Trail on Mount Tam is a beautiful hike. With David Arora’s field guide in hand, a basket, a knife and paper bags we headed out to Mount Tam’s Cataract Trail. Less than 5 minutes onto the trail Kate Merrill spotted a bit of glossy burgundy under the duff. Shrimp Russulas! By the time we made it to Laurel Dell, we’d completely filled up two big ghana baskets with mosty russulas and a half dozen incredible Fall Coccoras. Kate and her first HUGE coccora. When we got to the picnic area in the dell, we laid out our finds and double checked our IDs. We went through and visually checked them and abandoned a couple that we were uncertain about. Once we’d visually eliminated a couple, we went through and tasted a tiny corner of each cap to make sure their flavor matched the ID as well. Shrimp Russulas have a mild or lightly “shrimpy” flavor while its lookalike tastes “peppery”. This was my first time foraging for this mushroom so I was wondering a bit what was meant by “peppery” until I came across one of the inedible ones. WOWSA! My tongue tingled and burned. I spat out the tiny flake of mushroom I had tasted and immediately removed the offending mushroom from the group. Up until that moment I had no idea they would be so distinct, but the experience gave me more confidence in my ability to positively ID these delicious fungi. Russulas laid out for IDing at lunch time. Our foray was overall a sucess and we brought back around 10lbs. Mount Tamalpias allows each person to forage 4lbs of material so between the three of us we were under the limit but had quite a bit. Kate and Kitty spent the next afternoon processing them and Kate took the shroomies home to dehydrate them. Remember that Mushroom hunting is a lot of fun, but eating what you find poses risks. Only do so once you’re totally sure you’ve positively identified your fungi. Use a reliable mushroom guide like one of David Arora’s books and participate in events with your local Mycological Association to learn more.